Agents of a secretive DEA unit routinely receive tips from US intelligence agencies, including NSA intercepts, a report states. The sources are then concealed with “parallel construction” of evidence – a troubling practice that many call unconstitutional. 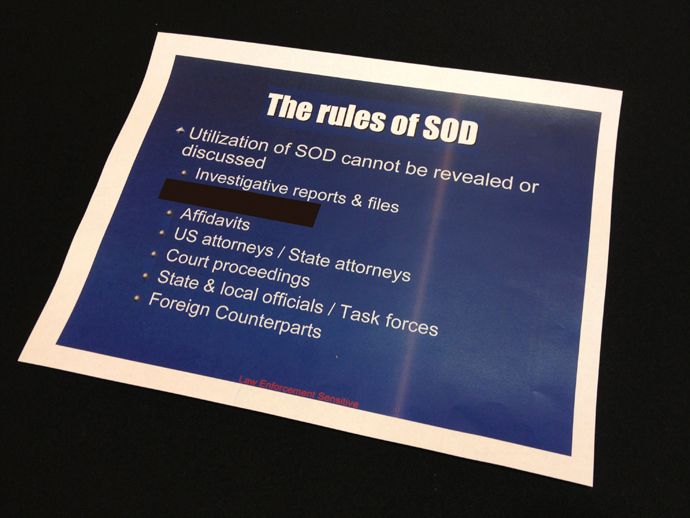 A document obtained by Reuters “specifically directs” the agents of the Special Operations Division (SOD) to cover up their information sources from investigative reports, affidavits, discussions with prosecutors and courtroom testimony. Such sources may include intelligence intercepts, wiretaps, three-letter-agencies’ informants and a massive database of telephone records – all of which could reportedly be used to help the authorities launch criminal investigations of Americans. “Remember that the utilization of SOD cannot be revealed or discussed in any investigative function,” reads the document, which is said to be presented to the agents of this Drug Enforcement Administration (DEA) unit. SOD is comprised of two dozen partner agencies, which include the FBI, CIA, NSA, Internal Revenue Service and the Department of Homeland Security, and much of the unit’s work is classified. The unit is said to be offering at least three services to federal, state and local law enforcement agents: coordinating international investigations; distributing tips from overseas NSA intercepts, informants, foreign law enforcement partners and domestic wiretaps; and circulating tips from a massive database known as DICE. This in effect means certain “tips” might be given to the agents and the police on condition they never talk about them in court. Following the arrest, the agents would then pretend the investigation started with the traffic stop, he said. This process, referred to as “parallel construction,” is a routine practice used by the agents, two senior DEA officials told the news agency, speaking on condition of anonymity. “Parallel construction is a law enforcement technique we use every day,” one official said, adding that it was “decades old, a bedrock concept” that was used to protect sources and investigative methods. While most of “a dozen” of other agents interviewed by Reuters were said to have defended the tactics as “legal,” former DEA agent Finn Selander has compared it to a criminal activity. “It’s just like laundering money – you work it backwards to make it clean,” Selander, who is now a member of the Law Enforcement Against Prohibition group, explained. Meanwhile, lawyers, prosecutors and legal experts have been outraged by the report, saying that if the so-called “parallel construction” was indeed used for disguising how an investigation began it explicitly violates pretrial discovery rules. Such practice “would not only be alarming but pretty blatantly unconstitutional,” Lawrence Lustberg, a New Jersey defense lawyer has said. In particular, it would violate the defendants’ Constitutional right to a fair trial, since if they don’t know how an investigation really began, they cannot ask to review potential sources of exculpatory evidence – information that could reveal entrapment, mistakes or biased witnesses. By use of the SOD program the US government could also “skirt” the established court procedures, by which judges privately examine sensitive information (informant’s identity, classified evidence etc.) to determine whether the information is relevant to the defense – something which some lawyers find unacceptable. “You can’t game the system. You can’t create this subterfuge. These are drug crimes, not national security cases. If you don’t draw the line here, where do you draw it?” said former federal prosecutor Henry E. Hockeimer Jr. The US legal system is very sensitive to the way the evidence is handled, and if the defense or prosecution finds its source inappropriate, the case may be overturned. An unnamed federal prosecutor said he refused to file charges in a Florida drug case after he learned a DEA agent “lied” to him about where the information came from – it was later revealed he had actually used a SOD tip based on an NSA intercept. The prosecutor said the fact of concealing the information source alone made him lose confidence in the investigation. Nancy Gertner, a Harvard Law School professor who served as a federal judge for 17 years, said the report sounds more troubling than recent Edward Snowden revelations that the NSA has been indiscriminately collecting domestic phone records. “It is one thing to create special rules for national security. Ordinary crime is entirely different. It sounds like they are phonying up investigations,” Gertner believes. The Special Operations Division was created in 1994 to initially combat Latin American drug cartels, and has since grown from several dozen employees to several hundred. Since its inception, the SOD’s mandate has expanded to include narco-terrorism, organized crime and gangs. A recent LinkedIn posting on the personal page of a senior SOD official reportedly estimated the unit’s annual budget to be $125 million. The unit played a major role in the case against Russian arms dealer Viktor Bout, who was extradited to the US from Thailand and in 2011 sentenced to 25 years in jail on charges of conspiring to sell weapons to the Colombian rebel group FARC. According to DEA officials, the DICE database they use contains about 1 billion records and largely consists of phone logs and Internet data gathered legally by the DEA through subpoenas, arrests and search warrants nationwide. Those records are said to be kept for about a year and then purged. About 10,000 federal, state and local law enforcement agents use the DICE database “to connect the dots,” according to an official cited by Reuters. But the DEA official insists that tips from intelligence agencies, such as the NSA, are generally not forwarded to the SOD until a caller’s citizenship can be verified, as warrantless eavesdropping on Americans is illegal.